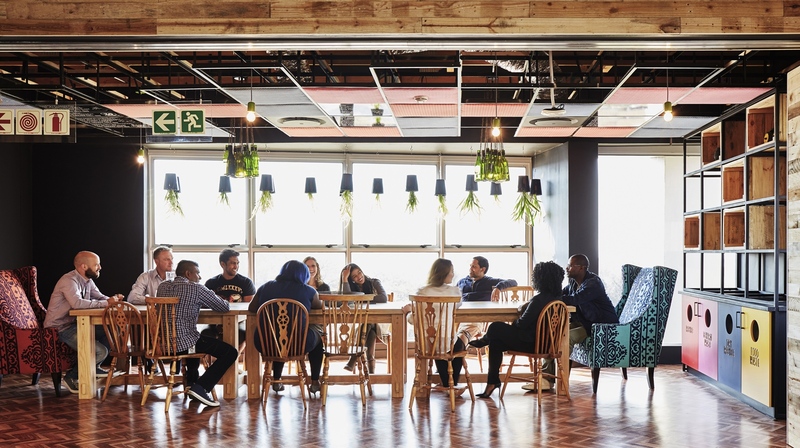 Google’s award-winning Head Office in Johannesburg has just received 5-star Green Star SA Interiors certification from the Green Building Council of South Africa (GBCSA). Having already clinched the International Green Interior Award 2015, the office is an exercise in locally inspired design matched with both green and wellness considerations. The project is also raising the green-interiors bar with ambitious LEED (Leadership in Energy and Environmental Design) and Healthy Materials targets. To deliver on the client’s green aspirations under an extremely tight timeframe, Solid Green Consulting and Ecocentric Green Building Consultants joined forces to deliver a complex process – including a comparative analysis of Green Star SA and LEED – that met the client’s Healthy Materials Program requirements, in line with Google’s drive to create a healthy and productive work environment to energise and inspire its employees. Under #GreenStarSA, initiatives that address environmental concerns outside of the current scope of the relevant Green Star SA tool can be awarded Innovation points. In addition to a point for the Healthy Materials Program, Innovation points were given for two initiatives: Design-led Workspace (in which employees who have control over their workspaces are happier, healthier and more productive); and Thermal Verification Survey (monitoring for thermal comfort for a period of 6–12 months after handover). Using recycled and repurposed materials for several aspects of the interior fit-out. Low-flow water fittings and taps with temperature regulators to ensure reduced use of hot water. LED lighting with occupancy and daylight control. HVAC invertor units with occupancy control. Waste recycling of paper, plastic, glass and metals.